Assumptions about how millennials will spend their money as they progress through adulthood continue to be proven inaccurate, or at least misunderstood. This is particularly true in real estate, specifically the places where Americans now in their 20s and 30s most want to live. A new study from Ernst and Young based on a survey of more than 1,200 20- to 36-year-olds adds to the growing list of expectations that millennials are defying: most of them are buying their first homes in the suburbs, not unlike their parents and previous generations. Among homeowner respondents to the Ernst and Young survey of millennials, 41 percent said they lived in the suburbs, far more than those who said they lived in a core urban area (31 percent). Even after including respondents who currently rent or live with their parents, the suburbs still won out among this key age group, if just barely: 38 percent said they lived in the suburbs, while 37 percent lived in a city. The remaining 24 percent said they lived either in a “small town” or a rural area. Contrary to some reports, this cohort of young adults has made significant progress financially in just the last two years. 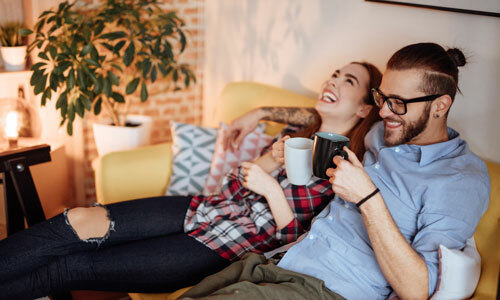 Ernst and Young found that homeownership among those age 28 to 31 increased from 27 percent to 47 percent between 2016 and 2018. In that same period, homeownership among those age 32 to 36 increased from 46 percent to 57 percent. And bucking another generational stereotype, the survey found that only 16 percent of millennial respondents lived with their parents today, compared to 30 percent who said so in 2016. So why are millennial homebuyers eschewing hip urban centers for houses further out from the city’s core? Cost is the primary and most obvious factor, Ernst and Young tax policy leader Cathy Koch told CNBC in an interview on the report. But it may also because these younger buyers are not moving into the same kind of suburbs their parents or grandparents did. As Koch hints at, more millennials may not necessarily be choosing to live in the suburbs, but rather choosing to identify their neighborhood as suburban. A report from Citylab highlights this perplexing issue that has broad implications for the real estate industry: A majority of Americans now identify their neighborhoods as suburban, even though federal data doesn’t exactly reflect that. As currently categorized by the U.S. Census Bureau and the federal Office of Management and Budget, most people living in what are officially known as “Urbanized Areas” consider themselves suburbs-dwellers. That includes Chicago residents surveyed by the OMB, where 64 percent of those within the officially designated metropolitan area considered their neighborhood suburban. But in some of the fastest-growing metros like Atlanta, Dallas-Fort Worth, Houston and Phoenix, some two-thirds of people who reside in “central city” neighborhoods as defined by the OMB, considered their homes suburban. Ultimately, Citylab explained, economists and public agencies still haven’t agreed on what exactly defines a suburb in 2018. Semantics aside, one conclusion is clear regarding millennial homeownership trends: Price and location are still top considerations for younger buyers, even as the preconceived notions surrounding the latter evolve.